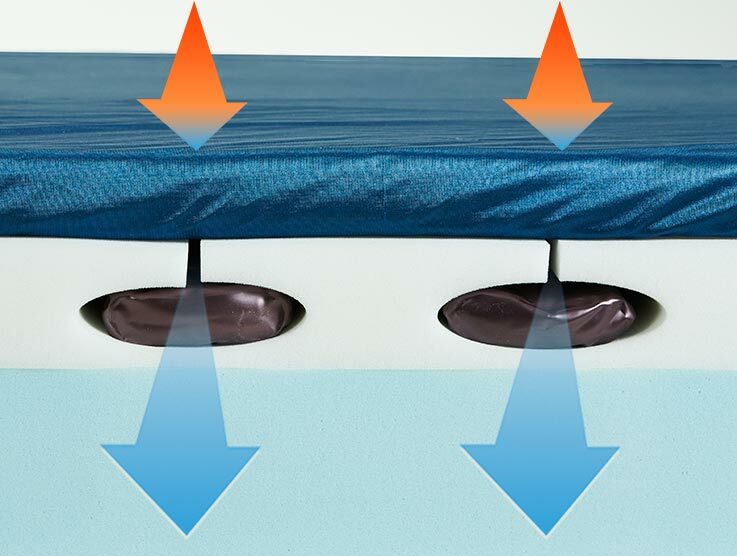 Foam beds, like Tempurpedic®* or Casper®**, are comprised of blocks of foam that absorb pressure. Over time this may form a body impression in your mattress. Foam beds generally have several layers of foam glued together to form a block. 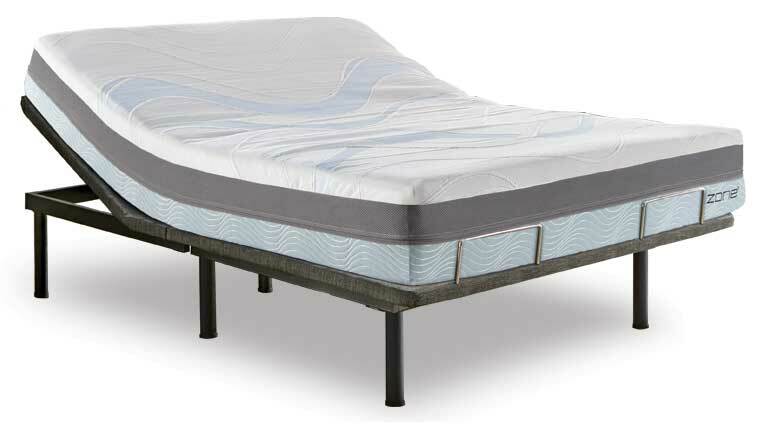 Your body weight can break down the top layer of foam which in turn may degrade the support structure, causing your bed to soften and lessen your level of comfort and support. With izone the pressure gets absorbed by the calibrators so the surrounding support and memory foam will keep their original shape and remain impression free. Memory foam has a reputation for sleeping hot. izone has responded to this negative by ventilating our memory foam, allowing air to circulate freely. When combined with our exclusive channel venting and the cooling properties of water filled calibrators, you will not have to worry about sleeping too hot again. We're cool with that if you are. When I switched to the izone bed, a listener of mine asked why I got rid of the brand name "memory foam" bed I purchased just 4 years ago. The answer for me is simple: technology and innovation have created the best possible combination of great sleep characteristics which give both my wife and me the greatest comfort we've ever experienced. Our ventilated open cell memory foam ensures that undesirable heat build up is minimized. Excess heat is naturally eliminated as it comes in contact with the water filled calibrators. Additionally, exclusive channel venting in the support foam creates a 'bellow' effect that circulates air and releases excess heat. izone is the first memory foam mattress that automatically adjusts to your size and sleep position. Our amazing design provides instant conformability. 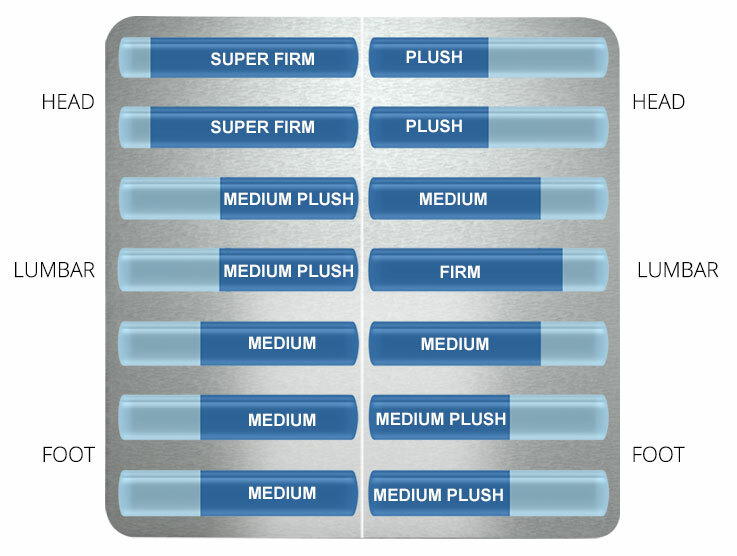 Each side of the bed offers you a choice of soft to super firm support in 7 individual zones from head to toe. Now both of you can be happy in the same bed. It is our goal to provide you with the safest products for your peace of mind. 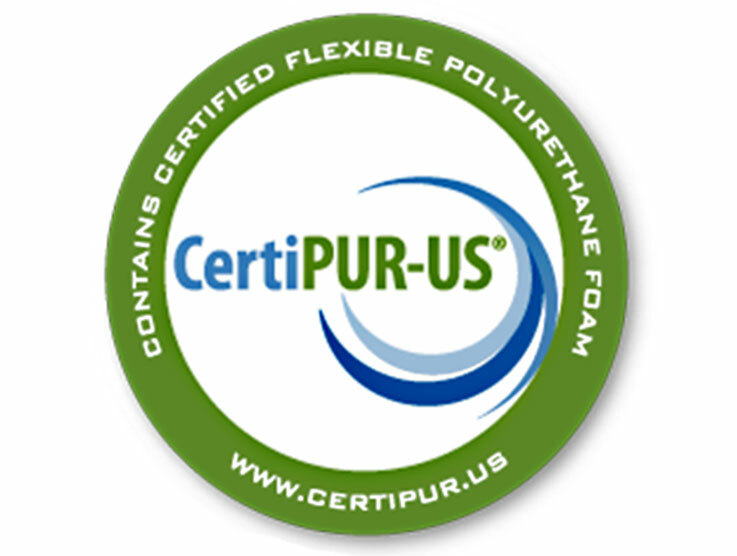 Our foams carry the CertiPUR-US® seal, so you know it meets the strict voluntary standards of the CertiPUR-US® program. Our production process assists in keeping ozone depleting VOC's from entering the atmosphere. 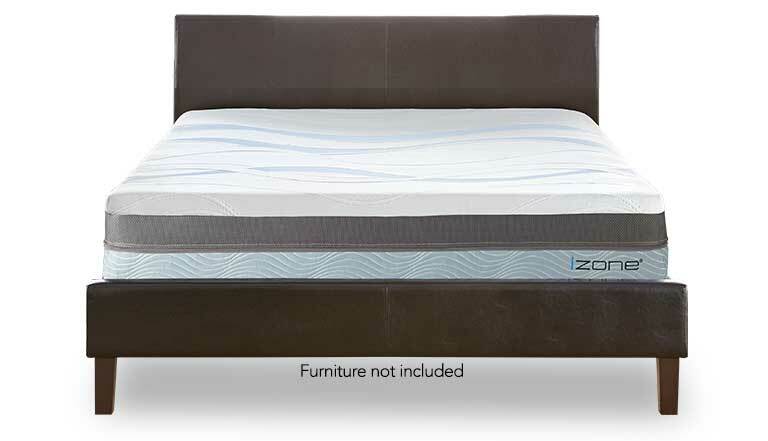 izone is the first memory foam mattress that can be precisely adjusted from head to toe on both sides of the bed. izone uses calibrators filled with water, a natural element, to create the adjustment between soft and firm in each of the seven zones on each side of the bed. Water will give you the adjustable support you need, but stays contouring and comfortable. Because both sides of the bed are able to adjust independently neither you nor your partner will need to compromise on the feel of your bed. You only need to set your side of the izone bed once for the perfect comfort and support every night. Channel cuts in the foam support layer as well as ventilated memory foam allow air to circulate freely and release excess heat. The unique properties of our air flow system combined with water filled calibrators ensure you are never too warm or too cool as you sleep. For your peace of mind, izone has a removable, washable cover and built in bed bug barrier, ensuring your bed remains clean and fresh for as long as you own it. Our CertiPUR-US® foams contain no harmful chemicals. 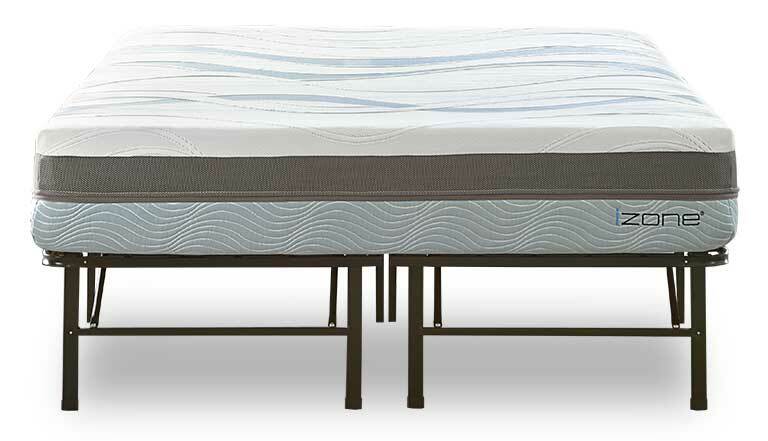 Our unique support system maximizes durability and ensures your bed remains as comfortable as the day you bought it. All izone beds carry a 10 year warranty. We also offer a 90 night "Test Rest" period. If for any reason you are not completely thrilled with your new bed, you can return it for FREE. (Yes, the return shipping is on us!) Rest easy, as izone is priced at about half of what you would pay for other less advanced mattress technologies. No bed can compare to the quality of sleep you get with izone, regardless of how much you spend. The all new izone bed can be purchased alone or paired with one of our Flex Bases for the the ultimate sleep experience. Experience all the izone bed has to offer and get ready to loose yourself in weightless luxury night after blissful night. Your new izone bed becomes so much more versatile when paired with the MotoFlex adjustable power base. The DynaFlex platform bed base can replace a traditional bed frame or box spring to support your new izone bed. ***No affiliation exists between iZoneBed.com and Tempurpedic®. TempurPedic ® and Tempur-Pedic ® are fully registered trademarks of Dan-Foam A/S Corporation. No product belonging to Tempurpedic® is sold on this site. Any references to Tempurpedic mattresses, pillows or topper models is for comparison purposes only. **No affiliation exists between iZoneBeds.com and Casper®. Casper® is a fully registered trademark of Casper Sleep Inc. No product belonging to Casper® is sold on this site and any reference is for comparison purposes only.